Ever found yourself checking out a sporting event, and getting frustrated at how "jumpy" your binoculars feel? That's because observing a moving target is a challenge with most handheld binocs. Canon's 12 x 32 IS binoculars solve this problem by using built-in image stabilization to deliver a smooth, steady view — even if what you're watching is moving. This pair of binoculars uses a battery-powered, continually-adjusting gyro mechanism to sense motion. This allows for real-time adjustments to what you're seeing, ensuring a bright, stable image that isn't typically achievable with non-stabilized binoculars. Canon equipped this model with two different image stabilization options. The powered IS mode is ideal for a still subject, like a bird on a tree branch. The non-powered IS mode is best for moving subjects, like a bird in flight, or an athlete on the field. These binoculars are a perfect companion for nature lovers. 12X magnification lets you check out animals or mountain vistas from a distance. Want to take in the moon without hauling your telescope outside? 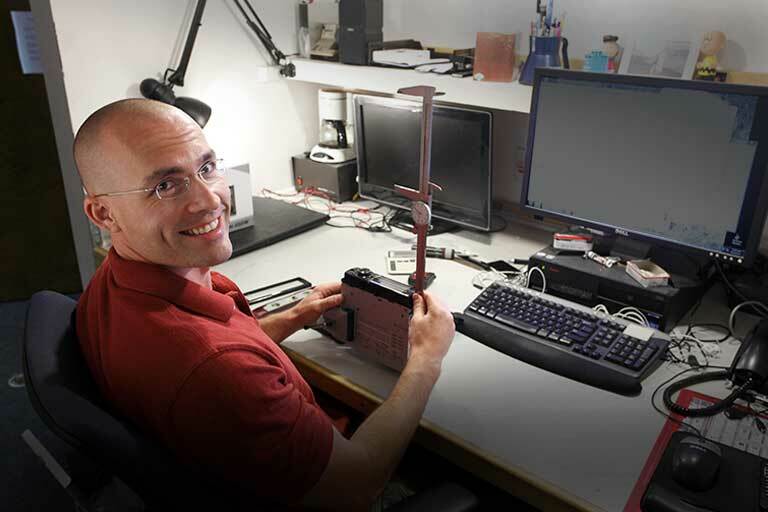 This is where image stabilization shines. No more propping yourself up against your car — or lugging around a tripod — to get a smooth view of the night sky. Overview: The Canon 12x32 IS binoculars feature excellent optics and Lens Shift Image Stabilization technology, borrowed from Canon's EF lenses. With its 12x high magnification, you can view faraway objects with great detail. 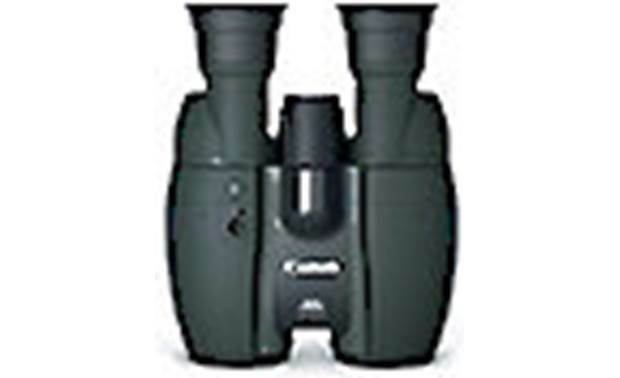 The binoculars have a minimum focusing distance of 6.6 feet (2 meters), which is notably shorter than many other models. The 12x32 IS comes with 2 AA batteries (to power the Image Stabilization), a comfortable, wide neck strap, and a storage case to protect your binoculars. Image Stabilization: The Lens Shift Image Stabilization system uses a continually adjusting vibration gyro mechanism to maintain a steady view. It cancels out possible shaking caused by hand movement or vibration by moving the IS lens both vertically and horizontally. You can switch between Normal IS and Powered IS at your fingertips. Normal IS can be used to track subjects in motion. Powered IS provides a steadier image by countering the user's movement when focusing on a still object. When pressing and releasing the Stabilizer button or the Powered IS button, the General IS or Powered IS will operate continuously five minutes (respectively). Power Requirements: The 12x32 IS requires two AA batteries to power the Powered IS feature. Based on Canon testing, two alkaline batteries (included) last approximately 10 hours at 73°F, and about 2 hours at 14°F (continuous use). Nickel-metal Hydride (Ni-MH) rechargeable batteries can also be used. No battery life data is available for Ni-MH batteries. Field Flattener Lens: The 12x32 IS binoculars use a field-flattening lens element to give you a sharp image across the entire field of view. The field-flattener lens element counters the blurring effect usually caused by the curvature of conventional lens elements. Ring Diopter: The right eyepiece features a dioptric correction ring that lets you adjust the focus of each eyepiece independently. The diopter range is +/- 3. Super Spectra Coating: To give you clear and vivid color rendering, the lenses feature Super Spectra Coating. The coating suppresses reflected light to eliminate color bias, lens flare, and ghosting to provide sharp, high definition images with high contrast. 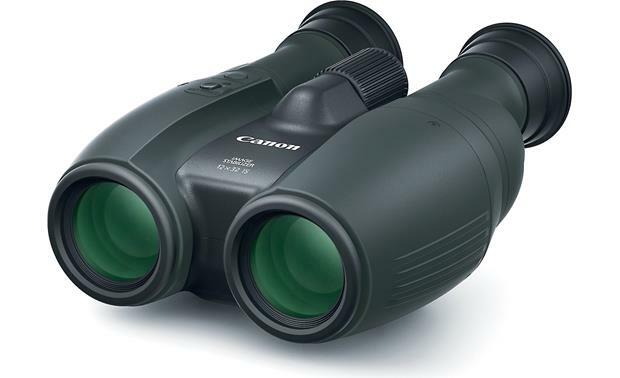 Dimensions: Width 5.592", Height 2.76", Depth 6.733"
Searches related to the Canon 12 x 32 IS Binoculars High-performance 12X binoculars with built-in image stabilization.